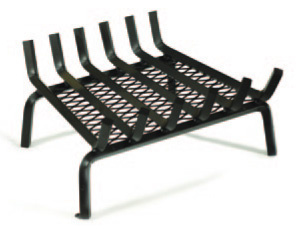 The Contoured fireplace grate features a sloped back, allowing you to stack your firewood higher; as the lower log burns the upper logs shift towards the front for a self-feeding fire. Available in 4 sizes. Made in America. 6 20" 17" 4-1/2" 16"
7 24" 20" 4-1/2" 16"
8 28" 24" 4-1/2" 16"
9 32" 28" 4-1/2" 16"